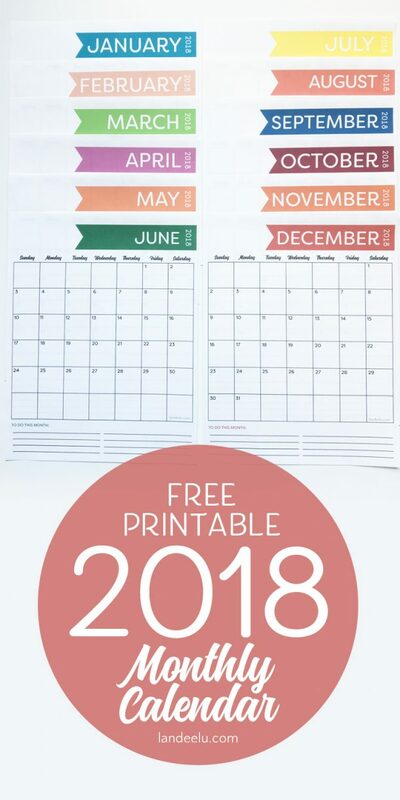 If you’re looking for the perfect 2018 Free Monthly Calendar, you’ve come to the right place! This simple, ink-friendly, vertically oriented calendar is perfect for so many different things. You are going to make 2018 your most organized year yet! And bonus, there’s space at the bottom of each month to make a little to-do list. It’s just what you need to keep track of your month at a glance. I realize there are a lot of different monthly calendars out there but I think that if you give this one a try you’ll be one of those people who come back to me in JULY of next year wondering when the 2019 version will be coming out. I love a good pen and paper calendar and, from what I’ve seen, I’m not the only one! This version is designed to give you plenty of space in each box to keep yourself on track each month. Simple fonts, simple design, fun colors…what’s not to love? You can download this 2018 FREE MONTHLY CALENDAR HERE if you’d like to have it! If you’d rather have a calendar that was oriented horizontally, you can get my 2018 Free Calendar (horizontal) HERE. It’s designed almost identically to this one but has slightly larger boxes to write in and no to-do list at the bottom. Be sure to check it out! 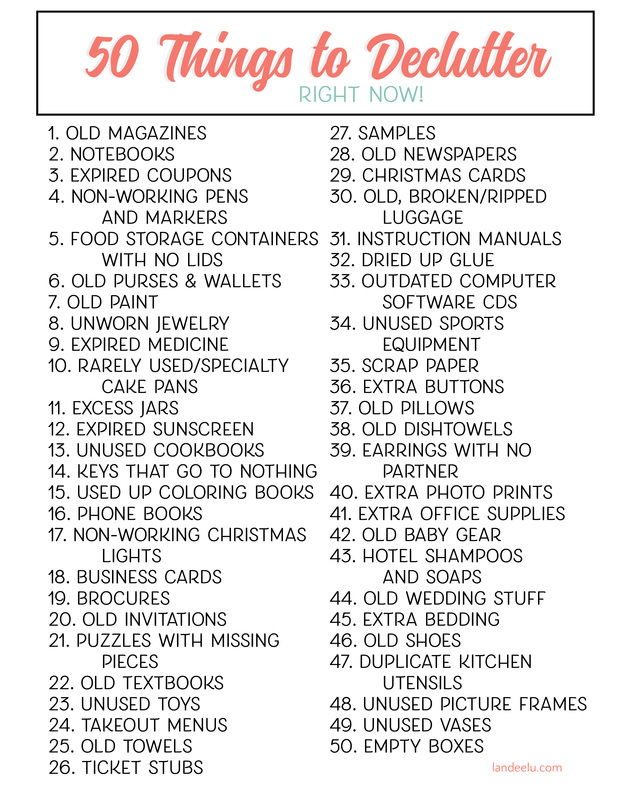 If you’re interested in more organizational printables and ideas, you can click the links below for lots of awesome ideas and free goodies! You rock! I have been printing your calendar for a couple of years now, and I had to laugh when I read what you wrote about checking for the new one in July, since here I am checking in August. So thanks for being so ahead — you know your audience! I’m here to serve! 😀 Thanks for coming by to get the new one! Love it love it love it!!! I was so glad you had the lightly printed website at the bottom of the page so I could remember where I found it last year so that I can get it again for this coming year. I love the vertical format with the notes lines at the bottom. Perfect for turning in my lesson plans to the office. I like to put the art projects for the month in a list at the bottom rather than assigning them to a particular week or day. Thanks so much for making these and making it free! Thank you! I love these calendars. I have last years set and was hoping for 2018. I love these so much. Love your calendars-thank you! I’ve been using them for several years, mainly as our family meal planning calendar. I love the clean lines and simplicity but with a splash of color—perfect! Thank you! These calendars are beautiful and exactly what I have been looking for!! Made my day! Oh I’m so glad! Thanks Amy! I love your calendars and come back every year for the new one! Thank you so, so much for sharing. Your website is one of my very favorites. Oh thank you Donna! I love to hear when people are using my designs! Thank you so much Donna, I simply love your printable planner. It’s really useful to have the website at the bottom as it’s the third year I use it and the only way I can remember the website is through that. Wishing you all the best for 2018. I love your monthly calendars and use them for planning purposes, always keeping the next 6 months up on my whiteboard. Will be wanting to hang January 2019 in August. Do you plan to produce some for 2019, and if so, when would you be sharing them? Hi Michelle! I am planning on working on those this coming week and hopefully getting them posted by the end of the month. Thank you! LOVE my Landee calendars! When will the 2019 version make it’s grand entrance? THANK YOU for doing these!! Hi Joette! The 2019 calendars are up on the blog now! Hi Landee! I’ve been using your calendars for my family for the last 2 or 3 years. I’ll be on the lookout for the 2019 calendar. Thanks! Hi Silvia! The 2019 calendars are up on the blog now!